Cause marketing sponsors might have several reasons for engaging in cause marketing including boosting sales, building brand, and bolstering PR, among others. One of those goals might also be to give customers a good reason to come back after supporting a cause. Informally, it’s called a bounceback and you’ll see it commonly in retail settings for food and other consumables. At the left is a current cause marketing campaign from Arby’s on behalf of a fundraiser called Happy Not Hungry that benefits childhood hunger fighting efforts from the Arby’s Foundation. Make a donation to Happy Not Hungry during the month of September and you’ll get a coupon for a free item from Arby’s value menu, when you also purchase something else. 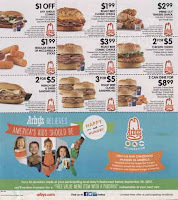 Although the flyer doesn’t mention it, the money passes through the Arby’s Foundation to No Kid Hungry campaign from the anti-hunger cause Share Our Strength. There’s two elements to get right in a bounceback offer. The first is that it has to both move people to donate as well as give them a compelling reason to come back. The second is much more bottom-line. After you get people in your store, you gotta get them spending money. A free coupon with no further purchase requirements might satisfy the first requirement, but not the second. It’s a fact of life that if people don’t have to spend money they won’t. So a free coupon with no purchase requirements guarantees that many people won’t crack open their wallets. In this case the purchase requirement doesn’t carry a minimum dollar amount, so presumably you could buy small cup of coffee or a turnover and fill the terms of the coupon. Naturally Arby’s is hoping that once you’re in the store you’ll get a hankering for some curly fries as well. After all, your main menu item is free. Normally these kinds of bounceback efforts have a paper element; the coupon in this case. But they needn’t be. Arby’s could certainly offer the coupon as a text, an email, or even as a debit card. Arby’s could also extend the cause marketing part of the promotion to the bounceback as well. For instance, spend at least 10 additional dollars on your bounceback trip and Arby’s will match your $1 donation to the Arby’s Foundation. Or, perhaps Arby’s could reward your bounceback in a non-monetary way. A Foursquare badge. An attaboy on Facebook or Twitter. Your name or picture added to Happy Not Hungry’s Pinterest page or an Internet donor wall. A cool ring tone for your phone. Your name in lights on Arby’s electronic menu boards, etc. It's great to know that Arby's is running this cause marketing campaign in September. I always like spending my money in places where I know it will benefit a cause. It's interesting how companies use the bounce back method in cause promotions. While boosting sales should be the top priority of a company, I believe companies should still have cause promotions just because it's the right thing to do. While I applaud Arby's efforts, I think there is a better way to boost sales while also boosting donations to Happy Not Hungry. For example, if Arby's donated a dollar to Happy Not Hungry for every two dollars a customer spent, I think people would be more willing to buy more food. I think Arby's is on the right track by offering a free menu item with the purchase of another item, and I also think it is good that there is no minimum dollar amount to spend. However, I feel that maybe if they did provide a required spending amount that perhaps more of those profits could be donated to Happy Not Hungry. Jessica also had a good idea with donating a certain dollar amount to another certain amount spent.